Running the Boston Marathon is for many an achievement of a lifetime. For members of Team With A Vision, a group of visually impaired runners with sighted guides, the challenge takes on a whole new meaning. With the proper tools and support, people who are visually impaired can do anything. The Massachusetts Association for the Blind and Visually Impaired (MABVI) has fielded Team With A Vision (TWAV) in the Boston Marathon for 23 years, and the 120th running of this historical event on April 18th will feature many world-class athletes who are proving that with the right support, people who are visually impaired can do anything they set their minds to. The Team’s runners—both visually impaired and sighted—participate to raise funds and awareness, and inspire others with disabilities. The team is a member of the 2016 Boston Marathon John Hancock Non-Profit Program. While some visually impaired runners have enough sight to run on their own, most have guides who run with them, often on short tethers, advising them of turns, potholes, potential collisions and other hazards. These running pairs often form long friendships, bonding through their shared challenges. Tim Sullivan of Hamilton, Ontario, Canada, is a VI runner in his second year on TWAV. He will not only be running the Marathon, but also running the BAA 5K alongside his 10-year-old daughter Grace, who hopes to one day guide him in the Marathon itself. Dan Berlin is an inspirational VI runner from Colorado, running with TWAV for the 4th time. In the past year, Dan broke the record for a visually impaired person running the Inca Trail to Machu Picchu. The previous year, he ran the Grand Canyon rim-to-rim and back! Diane Berberian is an accomplished VI runner from St. Petersburg, FL. A National Paratriathlon Champion who represented the US at the International Triathlon Union’s Paratriathlon Worlds, Diane’s grit, determination, and accomplishments in Iron Man competitions have earned her the nickname of “the Iron Maven.” Last year Diane completed the B.A.A. Distance Medley, placing first in the Women’s VI Division, and this year she returns to the Boston Marathon on TWAV. The athletes provide inspiration and the guides are impressive. Like Heather Armstrong, “Queen of the Mommy Bloggers”, a nationally known blogger and New York Times bestselling author raising a family and writing about it on her widely read blog, dooce, as well as in her books and essays. Armstrong was featured by Forbes magazine as one of 30 honorees on its list of “The Most Influential Women In Media” for 2009. This year she is writing in her blog about her experience as a guide with TWAV. In addition to the Boston Marathon, MABVI has also once again fielded a group of teen and young adult VI runners, Junior Team With A Vision, to compete in the B.A.A. 5K race. “With the proper tools and support, people who are visually impaired can do anything,” added Salisbury. “They inspire us, but are also a reminder that vision loss is a growing challenge as our population ages.” Within 15 years, the number of Americans with blindness or vision loss is expected to double, costing billions in physical and mental health care costs and lost wages. To address the problem, in May MABVI is hosting Solutions in Sight, A Summit to Address the Vision Loss Crisis. The Summit’s purpose is to address the difficulties of dealing with blindness and vision loss among a rapidly expanding senior population. With the Marathon less than a month away, Team With A Vision has already raised more than $80,000, with a goal of $150,000 for the 2016 event. 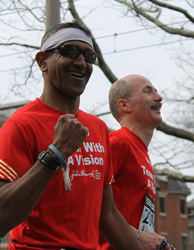 Team With A Vision was created to raise funds and awareness for MABVI and to promote greater involvement of visually impaired runners in the Boston Marathon. MABVI works to show that disabilities, like other challenges, can be overcome in the world of sport, and by translation, in any setting. The team is a proud member of the 2016 Boston Marathon John Hancock Non-Profit Program. 2016 will mark the 31st year of John Hancock’s sponsorship of the Boston Marathon, and Team With A Vision members join more than 1,000 runners and 140 organizations participating in this year’s program. Massachusetts Association for the Blind and Visually Impaired (MABVI) is the oldest social service organization in the country that serves adults and elders who are blind or visually impaired. They provide vision rehabilitation services and partner with community and medical groups to create high-impact, cost-effective services. TWAV is an international team of blind, visually impaired, and sighted runners committed to race and raise funds for the cause. 2016 is the Team’s 23rd year participating in the Boston Marathon.